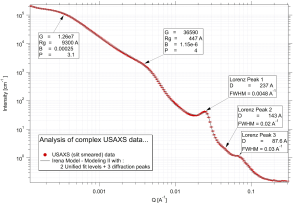 Maybe you heard my name, Jan Ilavsky, perhaps in association with Ultra-Small Angle Scattering (USAXS) instrument, Irena or Nika software packages, or in relationship with Glassy Carbon absolute intensity standard? We will get to each of these in a few lines, but in order to understand me, you need to understand my history. 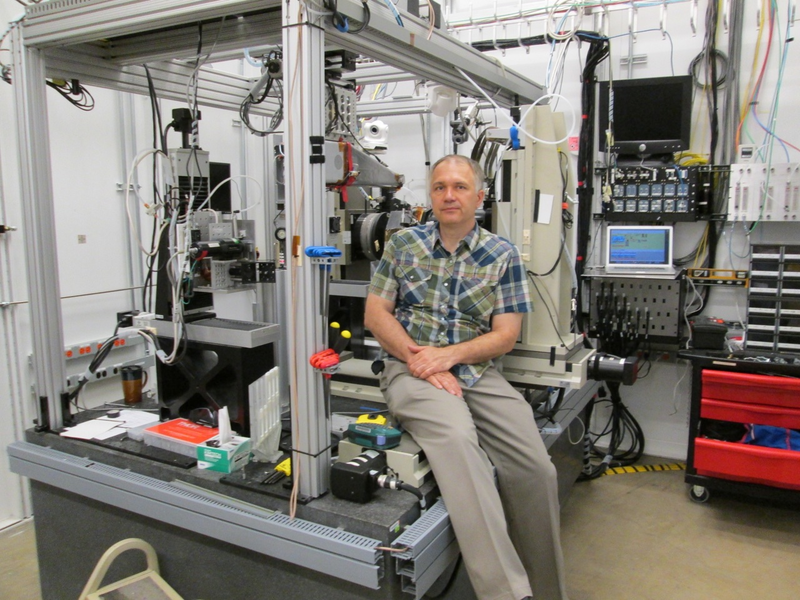 I graduated as a “scientist” from Charles University in Prague, School of Mathematics and Physics, in the mid-80s with X-ray diffraction thesis. 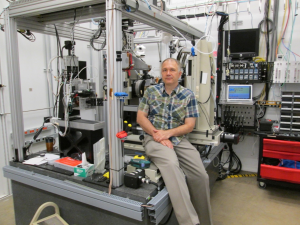 Then, however, I “run away” from science into an applied engineering field and concentrated more on materials science and, specifically, manufacturing and characterization of complex materials (hey, I actually thermally sprayed my own samples!). I received my PhD from SUNY at Sony Brook in Material Science and Engineering in 1994. At that time I became really interested in finding techniques and methods to provide (for complex applied materials) sufficiently useful microstructure characterization data that could be used for applied materials development and computer modelling of their properties. Originally, during the 90s I utilized SANS techniques, but they were too slow and inaccessible for practical needs of the really wide applied materials science community. Size ranges of the instrument, as compared to alternative techniques (click to magnify). 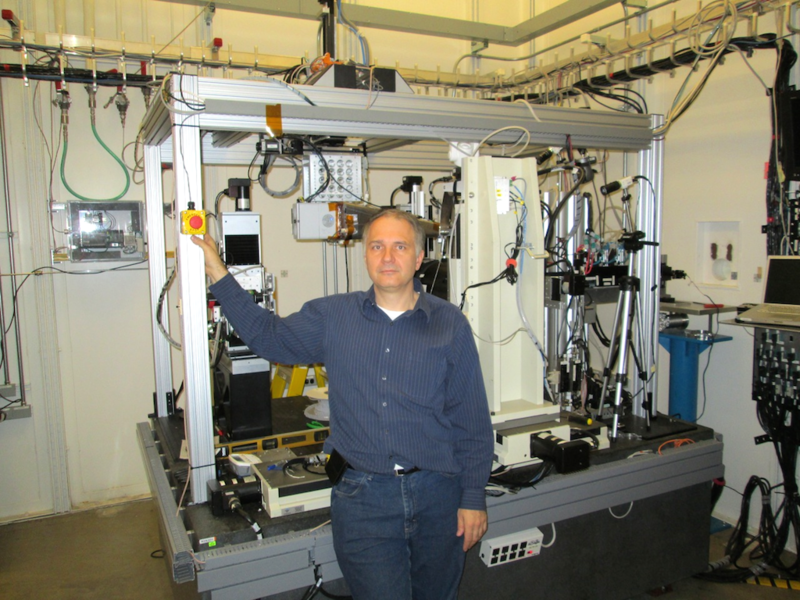 In 1999 I became a beamline scientist at the Advanced Photon Source, developing and operating one of only a few Bonse-Hart type USAXS instruments in the world. For those not familiar with Bonse-Hart instruments: these instruments can provide the widest range of sizes out of all common SAXS/SANS geometries. Nothing is free, however, the “cost” for this wide range is some hardware complexity. Bonse-Hart is step-scanning method, and (mostly) uses a slit smeared geometry. 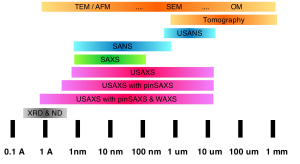 Currently, my USAXS instrument users enjoy truly unique capabilities: we can measure small-angle scattering from particles as large as 20 micrometers to as small as 3 nm using USAXS and to as small as 5 A by using optional SAXS capability. This range can be extended even further through the optional integrated WAXS capability, simultaneously providing users with powder diffraction data suitable for phase analysis (5 A to 0.7A d spacing). 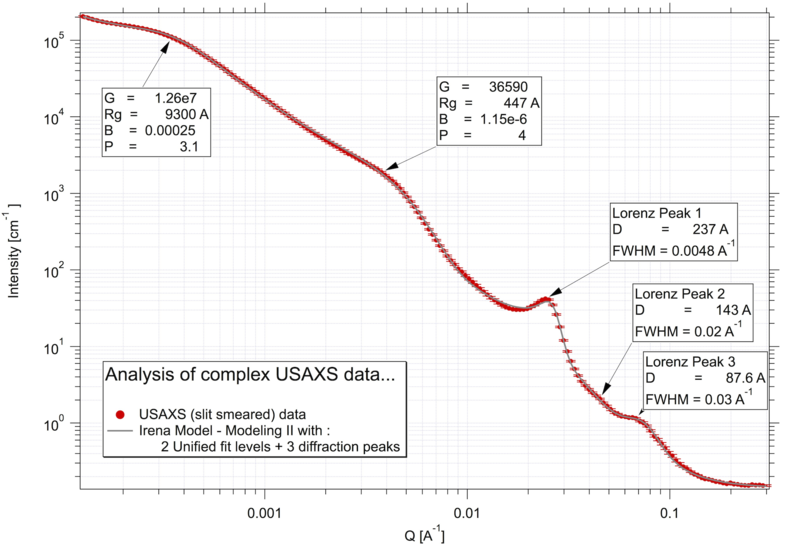 With USAXS data collection times as low as 2 minutes per scan, 10-15 seconds per SAXS and WAXS exposures, one can get – within less than 4 minutes – information about the sample microstructure over 5 decades (!) in size. With additional capabilities (USAXS Imaging, USAXS-XPCS, etc…) we have truly unique capabilities on hand. 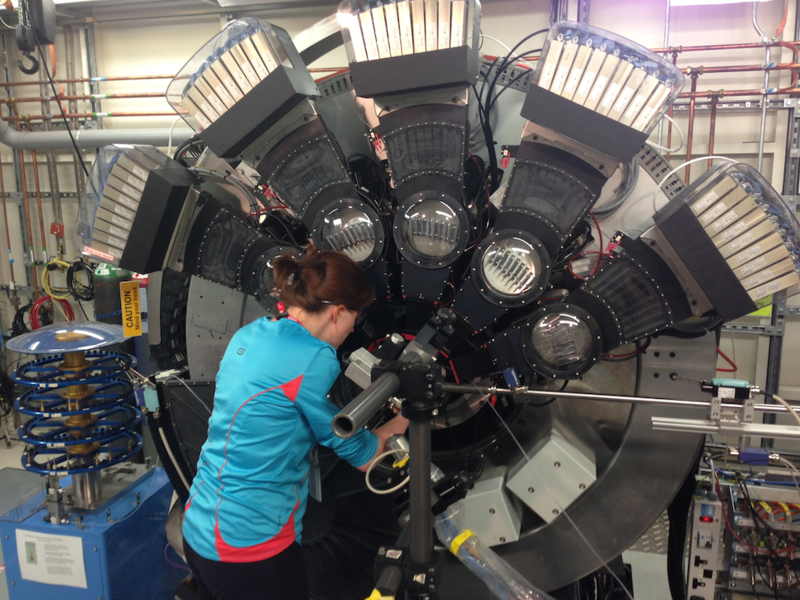 Finally, I have my “dream machine” – and it is really useful for complex materials microstructures and often fast enough for even in situ measurements! often materials science engineers, who are more familiar with other techniques such as microscopy, intrusion porosimetry, even mechanical property characterisation (e. g. tensile and compression testing…). To allow these users to operate the instrument, it needs to provide robust and simple operation. Over the about 15 years we have been developing our system, making it into an industrially reliable and user-friendly system, from which even novice users can easily obtain good data. Recently some of our users are food scientists familiar more with cheese making and other “arts” ☺. If you have a problem and think it can be solved using our capabilities, send me an e-mail (Ilavsky (at) aps.anl.gov). One of the unique features of this instrument is its absolute intensity calibration based on first principles. As materials engineer, from the very beginning I was fully aware of importance of quantitative results for the area of applied sciences. Since early 2000 I been providing the SAXS and SANS user community around the world with free glassy carbon artefacts (with absolutely calibrated intensity data), which can be used as secondary absolute intensity standard. Today, about 120 such samples are used through the world (need one? send me e-mail – Ilavsky (at) aps.anl.gov) and in a few months NIST should start selling their own certified glassy carbon absolute intensity standard (measured by our instrument) that the community will be able to procure and use. So here you go: now you know all there is about my scientific interests and also about me. I have a wide range of collaborations, not only within the USAXS user community, but also throughout the world in general. My e-mail is always on and if you need help or have interesting proposal, try sending me one, and maybe I’ll be interested! Ilavsky, J., Berndt, C. C., & Karthikeyan, J. (1997). Mercury intrusion porosimetry of plasma-sprayed ceramic. Journal Of Materials Science, 32(15), 3925-3932. 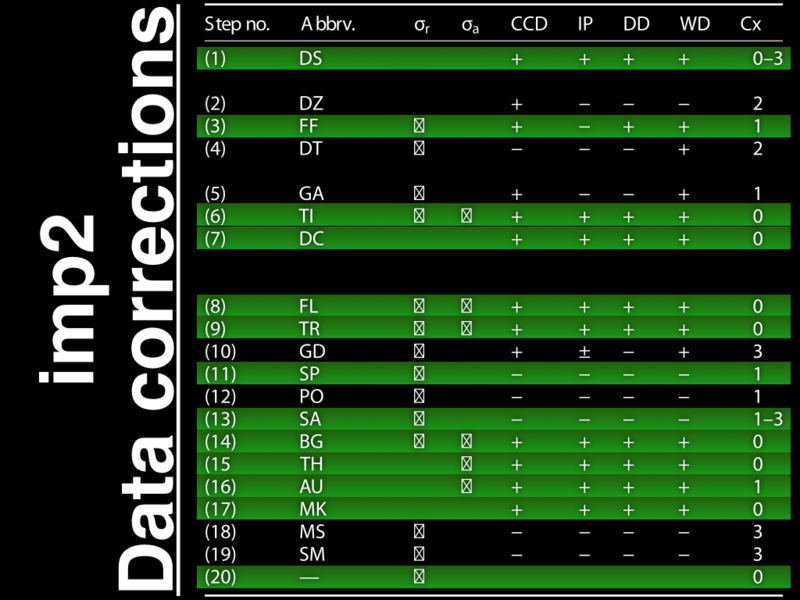 Ilavsky, J., Berndt, C. C., Herman, H., Chraska, P., & Dubsky, J. (1997). Alumina-base plasma-sprayed materials – Part II: Phase transformations in aluminas. Journal Of Thermal Spray Technology, 6(4), 439-444. Ilavsky, J., Allen, A. J., Long, G. G., Krueger, S., Berndt, C. C., & Herman, H. (1997). Influence of spray angle on the pore and crack microstructure of plasma-sprayed deposits. Journal Of The American Ceramic Society, 80(3), 733-742. Ilavsky, J., Allen, A. J., Long, G. G., Herman, H., & Berndt, C. C. (1997). Characterization of the closed porosity in plasma-sprayed alumina. Journal Of Materials Science, 32(13), 3407-3410. Used nika everyday for SAXS analysis! great work by Jan.